With a large extended family and a penchant for entertaining, the clients felt limited with their relatively small, screened-in porch. 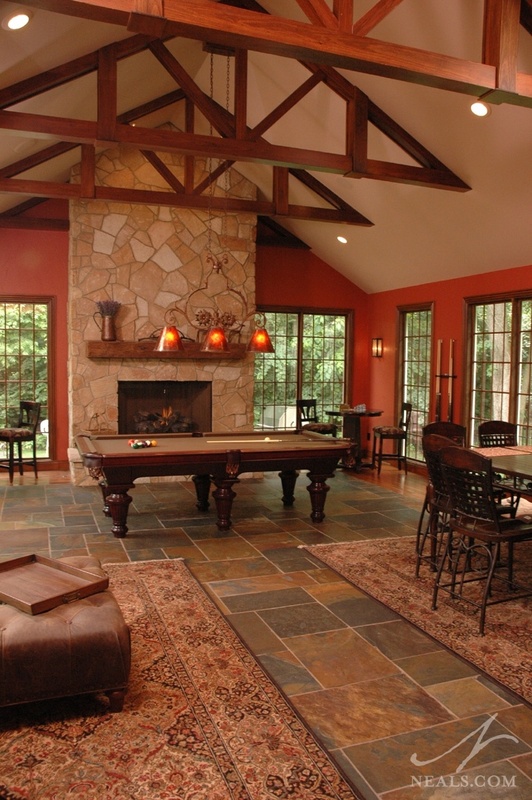 They desired a larger space for the wide variety of family gatherings and entertaining they enjoy. The completed project included a spacious all-season room addition and an outdoor patio great for entertaining as well as daily usage. This project was recognized as a 2010 Local & Regional Winner in the NARI Contractor of the Year Residential Addition category. 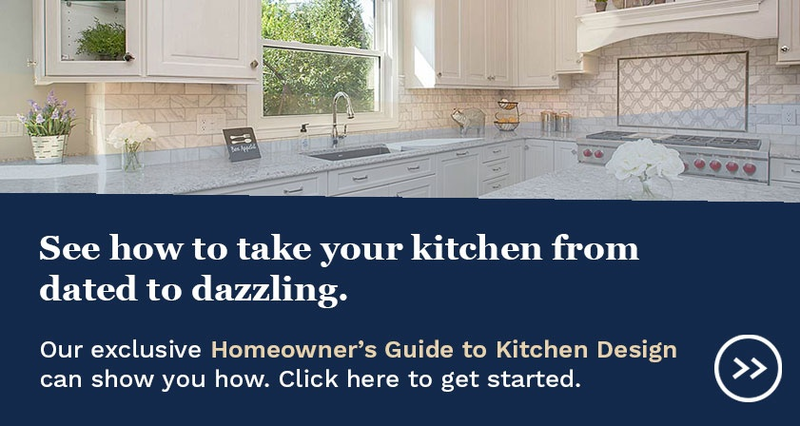 Among the most important goals for this project, the homeowners were interested in having a space reflective of the rustic ambiance they have enjoyed in their travels to America's western states. The interior space also needed to be large enough to accommodate a pool table and oversized pub table, but not feel too overwhelming when the family used the room for relaxation. They wanted the entire remodel, inside and out to work year-round by including an adjacent exterior space for warmer months. Finally, the addition needed to be seamlessly integrated with the existing home and landscaping. 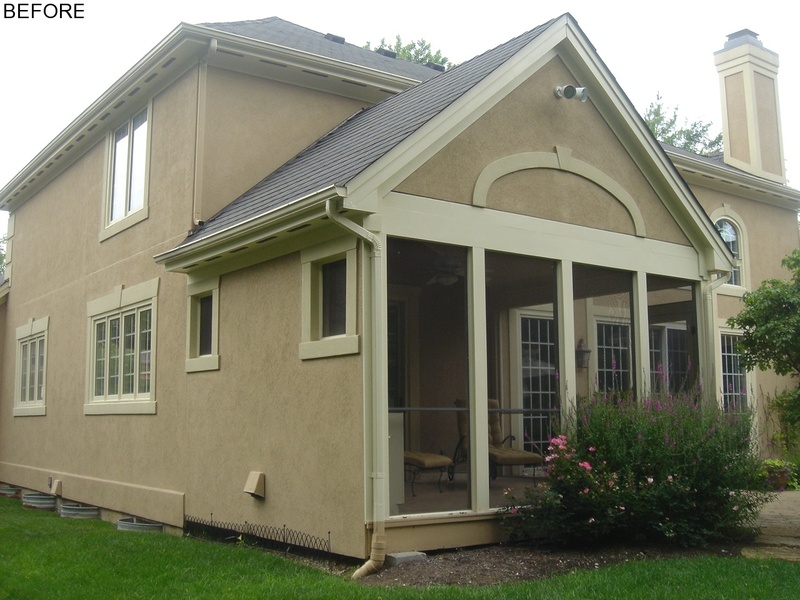 The removal of a screened-in porch was at the core of this remodel. While the relative placement of the porch was suitable, it was not large enough for comfortable entertaining of larger groups, and impossible to use year-round. 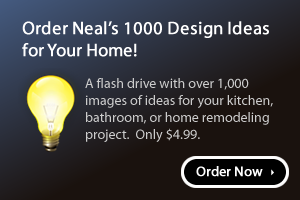 In addition, any HVAC units added to the home for the new space would create potential eysores on the exterior, which the homeowners hoped to avoid. Rather than creating a simple trenched footing for the addition, a crawlspace was excavated at a depth of roughly 4 feet. This created the space required for the HVAC installation, as well as assisted with creating a stable foundation. Off the addition, the existing patio was refreshed and enlarged, spilling over to a new patio completed with a fire pit. 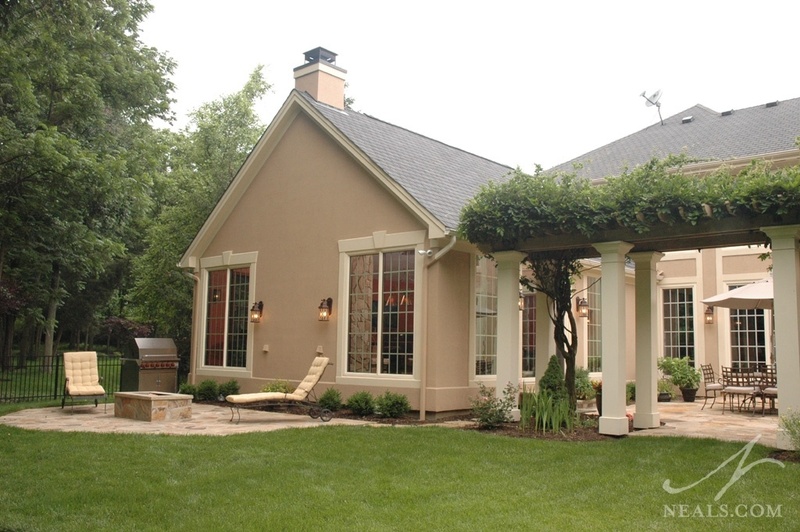 A new pergola adds classic charm. The room interior was designed to create the ambiance of a romantic, rustic lodge without differing too greatly from the existing home. Structurally, this was acheived by matching the rooms pitch, exterior stucco and window framing. Inside, the room came together with carefully selected materials that balanced the desired theme with the style of the house. One of the more important elements of the new room is the use of exposed trusses. This required the use of a custom roof support sytem that maximized the room's height to allow for the decorative trusses inside the room. The result is a cathedral ceiling that adds a sense of mountain lodge grandeur to the space. 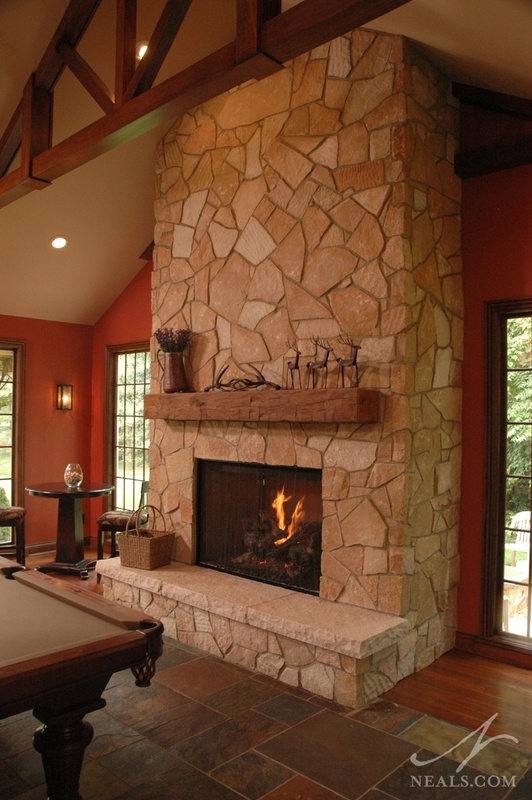 At the end of the room, a larger-than-life centerpiece fireplace, crafted from Highland Brown Web Wall Stone, creates the focal point. The hearth was created using limestone landscaping steps, and was finished with rough, chiseled edges. Stone here and at the bar area across the room was arranged in a random pattern for a hand-crafted look without stepping too far away from a cultured style. The mantle was fashioned from hand-hewn white pine, salvaged from an old barn, and was coated with linseed oil to give it a soft patina. 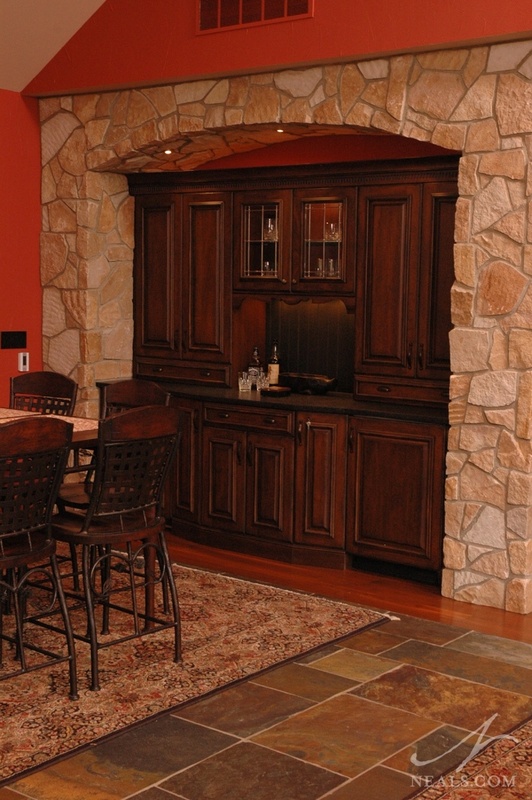 Distressed cabinetry in Esperanto with Antique Cherry and Sienna finishes was used at the bar. Exquisite hardware and 3-cm New Cambrian “Leather” granite countertops add even more finesse. The result is a traditional take on the well-worn wood finishes of the southwestt. The deep orange wall color and the multi-hued slate flooring further reflect a desert-themed palette. A heated, modular-pattern slate floor was achieved with patient craftsmanship. Extra time was allotted to lay it out so that very few cuts were require in the slate. 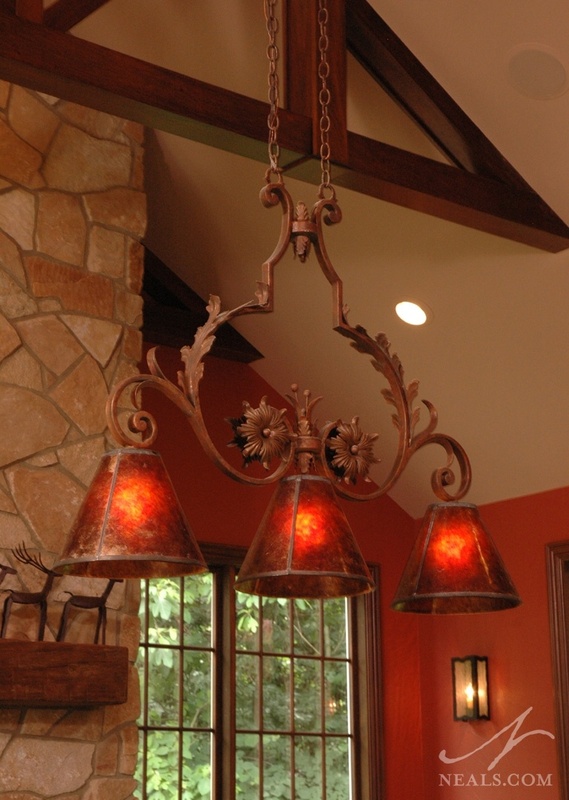 Distinctive fixtures, drop-in rope lighting in the ceiling beams, and interior/exterior lights with Lutron dimmers complete the engaging ambiance of this rustic retreat.